217th for "Best Online Bachelor's Programs"
The biggest gain was RIT's online executive MBA program, which jumped 10 spots on the list since last year. 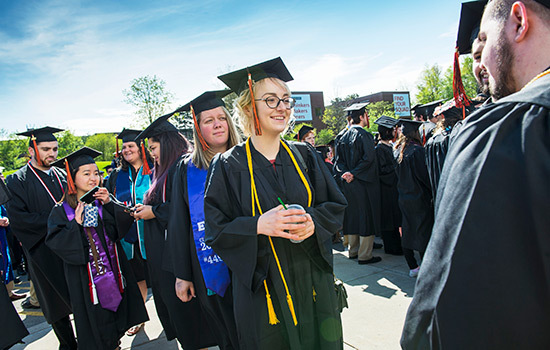 "It is an honor to again be recognized on a national level, amongst a growing collection of online education providers," said Jacqueline Mozrall, dean of RIT's Saunders College of Business. "What makes our executive MBA program so unique is the fusion of business, technology and leadership that we are able to offer here at RIT, deployed using a highly interactive, cohort-based, online pedagogy." The rankings are based on data collected from the nation's colleges and universities, which are then weighted by certain criteria, including engagement, faculty credentials and training, expert opinion, student excellence, and student services and technologies. Altogether, 1,545 online degree programs are cataloged in the usnews.com searchable directory-55 more than the previous year. All programs are required to be more than a year old with at least 10 students enrolled.